The Black Eyed Peas made an unexpected return to the scene earlier this week, with the back-to-basics “Yesterday.” The song saw the Peas (sans Fergie, still trying to reboot her solo career) namechecking any number of back-in-the-day hip-hop classics — including all-time favorites by Public Enemy, A Tribe Called Quest, and the Wu-Tang Clan, to name a few — and even dipped into the hooks and beats for most of them over the course of the song’s five-and-a-half minutes. 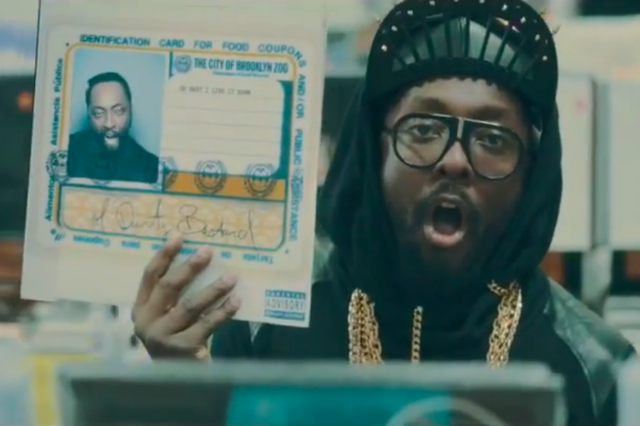 Appropriately enough, the clip’s accompanying video took will.i.am, apl.de.ap, and Taboo to the record store, and inserted them into the old vinyl art of the rap legends they were referencing. It was a cute idea, but it was someone else’s cute idea first. Erykah Badu tried out a very similar concept in her video for 2007’s “Honey,” in which the R&B singer found herself in the album covers for Funkadelic’s Maggot Brain, Eric B. & Rakim’s Paid in Full, and many others — at least one or two of which the BEPs also traveled through. Of course, conscious album art thievery has been going on forever, and it’s a somewhat slippery slope down the “No, it was my idea to reference a bunch of things first” path. But, yeah, it’s kind of hard to deny the conspicuous similarities here. The Black Eyed Peas should’ve probably at least slipped into the New Amerykah LP cover last, to show that the ultimate homage here was really to her.